Peak Light Output: Illumination over 100 footcandles is considered too bright. Wave Light peak output on desktop from 15" (380 mm) above surface less than 80 fc. Field of Illumination: 80 - 20 fc with light set 15" (380 mm) above desktop. Wave Light greater 24" diameter (610 mm) diameter. Illumination Contrast Ratio: Rate of decline in footcandles per inch from peak. Wave light spectrum declines less than 5 fc per inch (75 fc - 23 fc). 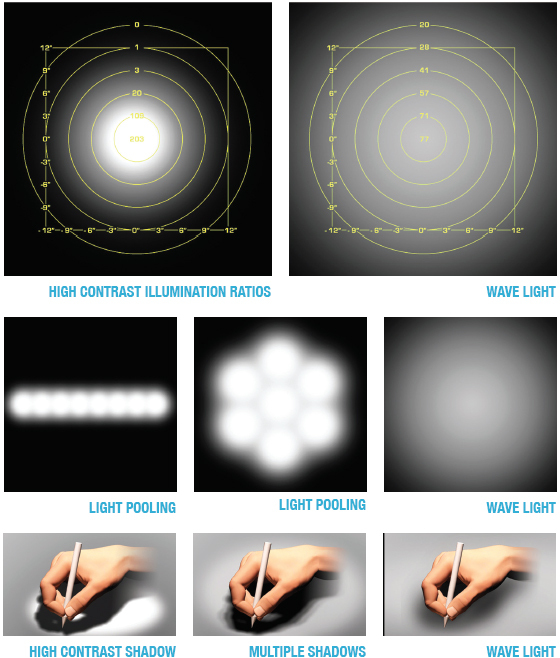 Light Pooling: Pools of light from multiple LEDs that result in excessive contrast ratios. Wave Light patented refractive lens eliminates light pooling. Shadows: Caused by multiple LEDs or overly bright light. Wave light minimizes shadows. Glare: From light source when viewed from eye level. Wave light design eliminates glare. Color Temperature: Ideal is 3400-4000K. Wave light is 3800K. CRI (Coloring Rendering Index): Ideal 65+. Wave light CRI is over 65. Dimmer: Enables users to adjust illumination levels to compensate for other light sources. Wave light has a 3 level dimmer. Luminous Efficacy: Ideal 30 - 45 Lm/W. Wave Light is 29 Lm/W. LED Life: Wave Light LEDs have a projected life in excess of 50,000 hours at full power. Arm Extension: 28" (71 cm) from fully folded. Light head can rotate 90 degree to arm. 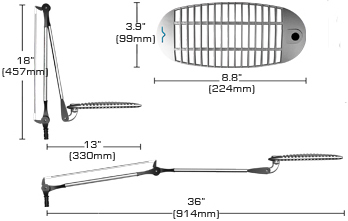 Mounting Options: Panel, C-Clamp, Slatwall, Beam and Freestanding. Electrical Input Power (Watts): High (11.0). Medium (5.8). Low (1.5). Post consumer recycled content used in packaging. Provides the desirable features of LED light without the drawbacks. While some LEDs may have a more desirable color temperature than fluorescent, conventional LED task lights often create an inadequate field of illumination, glare, light pooling, high contrast illumination ratios and /or multiple shadows. Wave light technology eliminates these drawbacks while providing a color temperature in the ideal range as well as a dimmer for adjusting illumination to the desired level. Ambient lighting, such as fluorescent ceiling fixtures, are designed to illuminate large areas and thus use significantly more energy than task lighting which is designed to illuminate the desired area only. While fluorescent ceiling lights have efficiency ratings similar to compact fluorescent lights (CFL) and light-emitting diode (LED) task lights, they use considerably more energy to provide comparable levels of illumination on work surfaces because they are positioned further away. A significant amount of this energy is wasted as it generates heat rather than light, resulting in higher HVAC cooling costs. In addition, the illumination provided by ambient lighting can vary greatly depending on the position of the work surface to light sources such as ceiling fixtures and windows. While LED task lights offer many advantages over CFL lights, such as lower energy costs and longer lifetime, LED light quality can vary greatly, especially with regard to the area of illumination, light pooling, shadows, glare, light contrast ratios and more. The patented refractive lens technology of the wave Light eliminates the shortcomings of other LED lights. 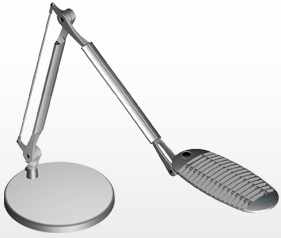 While most LED task lights were designed as desk lights and do not integrate well with office furniture systems, the Wave light was designed to meet the most demanding quality and functional standards for the office environment while integrating with virtually any furniture system. Question: Are replacement bulbs available to order with this unit? Answer: According to the manufacture, SpaceCo, the bulbs are not available for sale but they should not run out. In case they do SpaceCo can offer a replacement at no cost.